A Padel court, there are too kinds for doubles (20m x 10m) and for singles (20m x 6m). Around 90% of all the courts in the world are for doubles since single Padel is not common. Court is surrounded by walls of 3m in the back made of bricks or glass and mesh on the sides. A net that splits the court into two parts of 10m length and 0.88m height on the center and 0.92m on each end. A Padel Racket also known as Padel Bat. It is a string-less racket usually made of glass or carbon fiber, weights between 320 and 400gr and it is between 30-38mm thick. 3 Padel balls, they very similar to Tennis balls but with less pressure. Usually balls will never be left on the floor since every part of the ground is potentially used on the rallies and it could interfere. 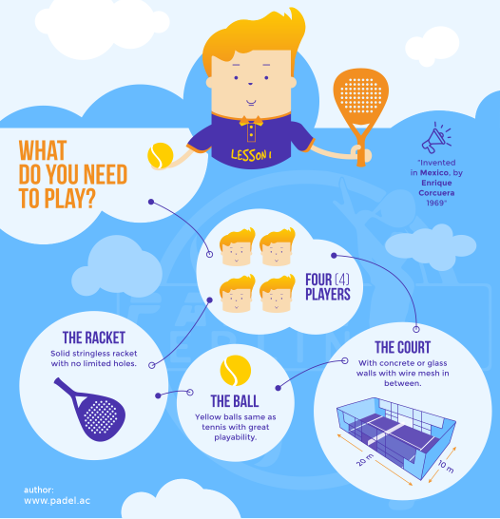 4 players, Padel is a social sport that it is commonly played its format of doubles, 2 vs 2. Serving team has 2 attempts per point, same as in Tennis. Serving player needs to be behind the service line, serve in diagonal and the ball should bounce first on his floor and then hit below the waist. Ball should end on the opponents box and should not touch the wire mesh side after the first bounce. Point system it's exactly the same as Tennis: 15; 30; 40; Point or Deuce. A set is won when a team collects 6 games and there is at least 2 games difference. If the score is 6-5 set is extended for one more game, if the outcome is 6-6 then there is tie-break same as Tennis. Winner is the best of 3 sets. In case you want to extend your knowledge with the official Padel regulation you can read the full documentation from the International Padel Federation.